At a ceremony in Washington DC on Thursday, May 17, 2012, Kingsbury, Inc. was awarded the coveted President's E-Star award to acknowledge the company's outstanding export growth. 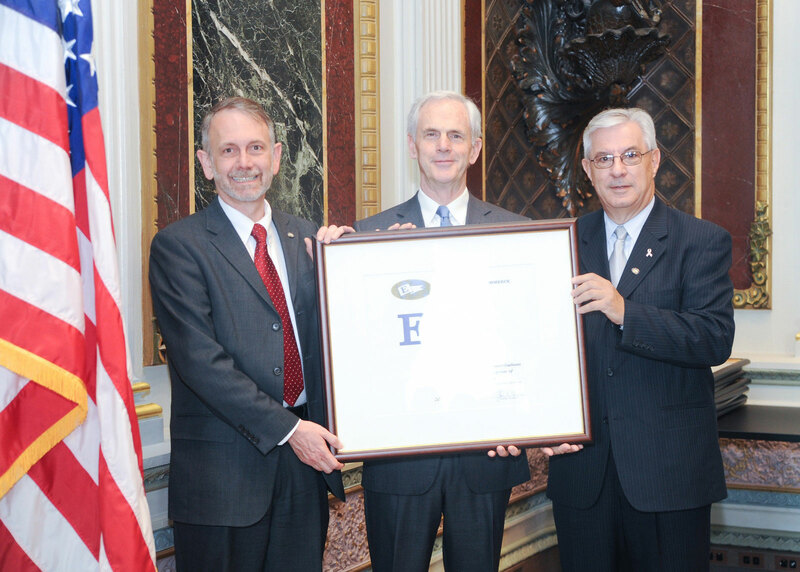 U.S. Commerce Secretary John Bryson spoke at the ceremony and cited Kingsbury in his speech as the only company in 2012 that had received an original E-Award in 1942 for its outstanding product quality to the government in support of the war effort. After the war, Kingsbury was given a second E-Award for quality, and another in 2002 for export excellence. Accepting the award on behalf of the company were Mark J. Kuhn, Business Development Manager (left) and Jerry Vogt, ITAR Compliance Officer (right). Since 1962, when President Kennedy revived the program, the Commerce Department has given the award annually to companies that have demonstrated a continuous commitment to exporting. The E-Star is given to companies that have previously won one or more E-Awards and have demonstrated three consecutive years of export growth. Kingsbury was one of only 10 companies given an E-Star award for export growth in 2009, 2010 and 2011.